Home - Blog - Events - NEW! 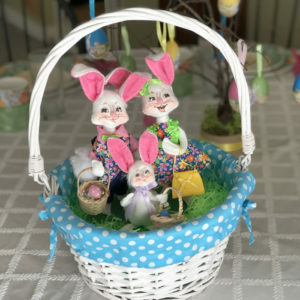 Easy Easter Decorating Kits! NEW! Easy Easter Decorating Kits! Annalee is proud to introduce Easy Decorating Kits! Add one of these ALL NEW spring decorating kits to your order to create a cute springtime display in minutes! We know you love to be creative with seasonal decor—but sometimes it can be tricky to find the perfect placement and accents. It’s because of your suggestions that we’ve created Easy Decorating Kits to help finish decorating with ease. Our spring decorating kits are available in four attractive colors and include a tin planter (approximately 9″ x 5″), a festive sign, two eggs, and green Spanish moss for just $15! Watch the videos below to see just how easy it is to complete a festive design for your home. Share your spring decor with us on Facebook, Instagram, or Twitter with the #AnnaleeSmiles! We would love to see how you’re celebrating spring! Add a Spring Easy Decorating Kit to Your Order! HOW TO: Assemble Your Kit in Minutes!